1. Newbies are hardly the target of an attack. Therefore, Newbies Attack Immunity is useless. Upgrade Government to as high a level as you can. 2. At early stage, no need to build any fortifications. Just complete Quests first. 3. When Equipment Wearability reaches 0, you can only recycle it or repair it with special item. 4. Do more simple tasks (i.e. scouting) before handling any serious tasks. 5. 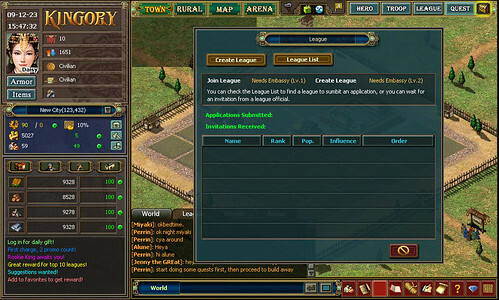 In the absence of metropolis city, quit the league when you go to bed and you can prevent your city from being invaded. 6. The higher the level of a hero and the wilderness, and the more troops sent for gathering, the higher the chance of finding treasures. 7. When one of your league members get attacked, the declaration of war by the entire league can be intimidating. 8. Capturing unemployed heroes who just defect from their cites to the wilderness is relatively easy. 9. Quest Build Up Renown can be seen unless wall is built. 10. Items for resource production is useless at first but somehow becomes important later. So play safe. Thanks for providing this guide admin!